Wind is characterised by its speed and its direction. Its function is to exert push and pull forces, to transport particles, to create air exchange, aeration, drifts and heat transfer as a consequence of turbulences and to make noises. It regulates the spreading of air pollutants and therefore plays a major role for the air hygiene in cities. A decisive element of Stuttgart's climate is the light wind, a fact which is not only the result of the city's position between two bights of the Keuper plains. The whole Neckar Valley is known for low wind speeds and very frequent lulls. This is the result of small air pressure differences common to Southern Germany and Stuttgart's sheltered position between the Black Forest, the Swabian Alb, the Schurwald and the Swabian-Franconian Forest. Due to orographic conditions, it is impossible to indicate a consistent wind rose for the whole of Stuttgart. What is the most likely wind rose to describe the local wind is the wind rose at Stuttgart airport. 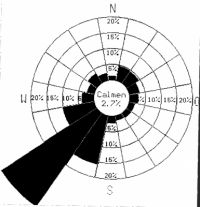 The direction of the most frequent (21 % on average) and also strongest winds here is 240° (west-southwest). The average wind speed at the airport is 2.5 m/s, which is very low. This is why local air exchange movements are more important here than in cities in Northern Germany. There are no wind measurements for the plan area for Stuttgart 21 yet, but there are measurements conducted at the city-owned measuring station Schwabenzentrum, which is located in the valley axis of the Nesenbach valley, 2 km from the plan area. Wind measurements are conducted there over the roofs in an altitude of 25 m above ground. Due to the topographic conditions, these measurements can be approximately transferred to the plan area for Stuttgart 21 as they are characteristic for the wind conditions in the Nesenbach valley. These measurements show that the average wind speed is about 2 m/s in the basin of the city and with this in the plan area for Stuttgart 21. So the wind speed is even lower than at the airport. Figures 5-1 and 5-2 list the distribution of the wind direction during the day and during the night. Both figures show that southwesterlies are generally more frequent as this is the main and typical wind direction in the Stuttgart region. The axis of the Nesenbach valley, which runs from Southwest to Northeast, has yet a canalising effect with the result that wind directions parallel to the valley axis are predominant in that part of the city basin which is situated in the course of the Nesenbach valley. 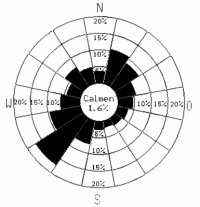 As the wind direction is one of the few meteorological factors which generally does not vary during the course of the day, the fact that there are different wind roses for day and for night suggests a circadian local wind system. The higher frequency of southwesterlies at night (38 % compared to 19 % in the daytime) is a result of the mountain wind that forms in the Nesenbach valley during the night, and the cold air produced at night above the open spaces in the Filder region and the Glems valley flows through the Nesenbach valley as the Nesenbächer wind. The cold-air flow dwindles during the day. This and the warming of the valley often lead to a reversal of the wind direction. The pictured wind roses reflect the conditions that result from the mingling of the local cold-air flow with the regional wind conditions. We can assume that the influence of the nightly mountain wind system reaches beyond the Schwabenzentrum measuring station to the Neckar valley. Given the little wind and need for air exchange, these local wind systems are desired as they contribute to the aeration and thermal balancing of the city basin with its rather poor air hygiene and thermal conditions. One of the main claims by Urban Climatology is the conservation of this local wind system, which is additionally fed by the slopes and their clefts. This requires the long-term conservation of the corresponding cold-air catchment areas.